Bittersweet Enchantment: Book Spotlight: Magic Within by Sara Fitzgerald | Excerpt + Book Trailer + Giveaway! 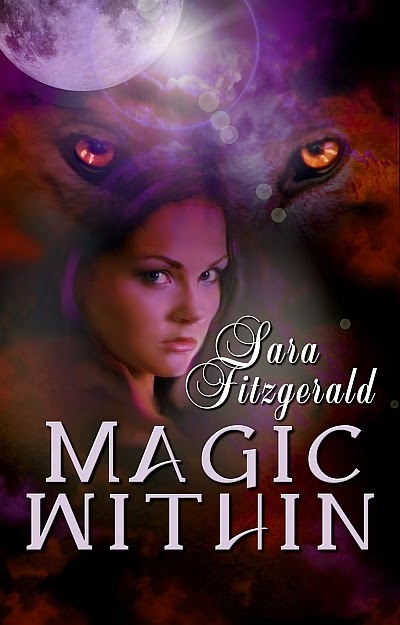 Book Spotlight: Magic Within by Sara Fitzgerald | Excerpt + Book Trailer + Giveaway! Today I'm helping author Sara Fitzgerald promote her new YA novel, Magic Within. The book is packed full of paranormal awesomeness - witches, werewolves, magic and romance! I will be sharing with you all about the book including a except, book trailer, and a giveaway to win a copy of the book (and a Amazon/B&N GC). Enjoy! Nancy, a purple-haired witch, has never fit in with the kids in town. She has always felt something was deeply wrong with her. When Josh, her best friend, is attacked by a werewolf, Nancy seeks a potion to save him from the werewolf curse within him. But Josh’s fate--werewolf or human--is his to decide, when the potion is injected during his transition at the full of the moon. Nancy, too, must make a choice. Her mother, her best friend, and a steadfast young man all see the magic within her. Can she finally accept who she is and give love a chance? In the blackness of the night, Josh growled from deep inside his body. The pain was intense. More than anything he’d experienced. He gasped and stared at the alluring full moon. His body violently twisted. He looked at his contorted hands; claws were forming. He was changing into a werewolf. This couldn’t be possible. He never even tasted human flesh and yet he’d always envied the power and freedom of Eric. To have no restraints. Nothing to constrain his behavior. Pure freedom. “No!” he screamed into the night. Not him. Yet the stupid darkness had always appealed to him. He had even wanted to be a bloodsucker. Did evil lurk within his soul? Was this his fate? To be changed into a monster? He frantically looked for Nancy, Nick and his sister. They were floating barely above him on the broomsticks. Horror flooded their faces, and tears filled his sister’s eyes. Nick raised his gun. Nancy quickly pushed it down. Sara lives with her husband and seven-year-old daughter in Salt Lake City. She loves romance, intrigue, writing and exploring the city with her family. Her two favorite parts of the day are reading bedtime stories with her daughter and hanging out with her husband. To enter please use the rafflecopter from below. 1 winner will receive an ebook copy of the book & $10 GC. Witches and werewolves... what a wonderful combination. Thanks for the giveaway.